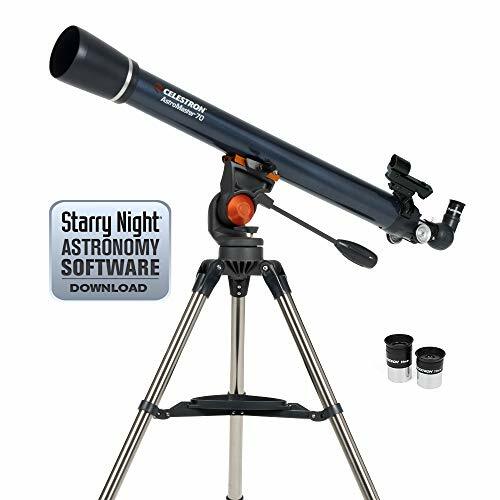 If you re looking for a dual-purpose telescope appropriate for both terrestrial and celestial viewing, then the AstroMaster Series is for you. Each AstroMaster model is capable of giving correct views of land and sky. The AstroMaster Series produce bright, clear images of the Moon and planets. It is easy to see the moons of Jupiter and the rings of Saturn with every one of these fine instruments. For views of the brighter deep space objects like galaxies and nebulae, we recommend the larger aperture and light gathering ability of the Newtonian reflectors. Our largest aperture SpaceProbe reflector telescope is the niftiest Newtonian reflector on an equatorial mount we've seen in a long time. The Orion SpaceProbe 130ST EQ Reflector Telescope is a step up from the standard SpaceProbe 130 EQ for the more serious beginning or intermediate stargazer who wants additional performance, particularly for targeting deep-sky objects. Just what's so nifty about the Orion SpaceProbe 130ST Equatorial Reflector Telescope? The answer is best described as short and sweet. First, the short. This ST, or Short Tube, version of the SpaceProbe 130 reflector is indeed more compact than the standard model. The 130ST reflector telescope's optical tube measures 24 inches long compared to 33 inches on the standard 130. The focal length of the ST's 130mm (5.1inch) primary mirror is 650mm (f/5), yielding a wider field of view and brighter images for a given telescope eyepiece focal length. That brings us to sweet. The 130mm aperture primary is a diffraction-limited parabolic mirror, the same type used on much larger reflector telescopes costing many times as much. On a short-focal-length design like this one, a parabolic mirror is a must for focusing incoming light to a point and delivering sharp, detailed images. Moreover, the secondary mirror is held in an advanced holder with thin 0.5mm metal vanes, to reduce diffraction spikes and light loss. These features combined with the included 25mm (26x power) and 10mm (65x power) Sirius Plossl telescope eyepieces and quick-release 6x30 achromatic finder scope make this one sweet optical system for astronomy! The SpaceProbe 130ST EQ reflector telescope also includes a collimation cap and center-marked primary mirror for easy optical alignment. The Orion SpaceProbe 130ST telescope comes on a sturdy and precise EQ-2 equatorial mount with dual setting circles and slow-motion hand controls. Telescope Specification - Aperture: 90mm(3.5in) - Focal Length: 600mm(23.62in) - Focal Ratio: F6.7 - Eyepiece1: 25mm(0.98in) - Magnification1: 24X - Eyepiece2: 10mm(0.39in) - Magnification2: 60X - Eyepiece3: 5mm(0.196n) - Magnification3: 120X - Max Magnification: 360 - Finderscope: 6*30 - Zenith Mirrors: 48 Erecting BAK7 prism - Mount: AZ Altazimuth Mount - Optical coating: Multi Antireflection Green Film - Barlow lens: 3X - Resolution: 2.8 - Angular Field of View: 1 36" - Tuble connection: Hook Dovetail Plate - Tripod: 1.27inch stainless steel Tripod About Refund Policy We support customers return goods if you don t like, But We suggest that if you have any problems please contact us first on amazon email directly,We have professional team and professional technical personnel to do the operation and guidance for you, I do hope you can support our work, and Love our products. About Feedback Your satisfaction and positive feedback is very important to us if you are satisfied with our items and services. If you have any problems with our items or services, please feel free to contact us first before you leave feedback. We will do our best to solve your any problems and provide you the best customer services. Product Description Gskyer Infinity have over 20 years Optical history,Use of Germany's advanced technology, for different groups of people from different telescopes for science, astronomy, exploration, and tourism, etc.Gskyer's value priced Powerseeker 90600AZ is an affordable entry high level telescope with some nice extras like a correct image prism and "The Sky" astronomy. High Quality Optics 600mm(f/6.7) focal length and 90mm aperture, fully coated optics glass lens with high transmission coatings creates stunning images and protect your eyes. High Magnification Come with three replaceable eyepieces(24X, 60X,120X) and one 3x Barlow lens. 3x Barlow lens trebles the magnifying power of each eyepiece. Adjustable Tripod This telescope allows for many different viewing positions with a adjustable aluminum tripod. The height of aluminum tripod can be adjusted from about 31.5-inch to 49-inch. 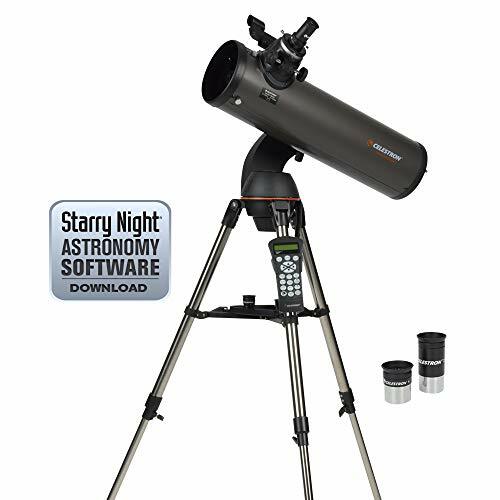 Easy to Operate No tools are required for reflecting telescope even for the novice, quick and easy to focus. 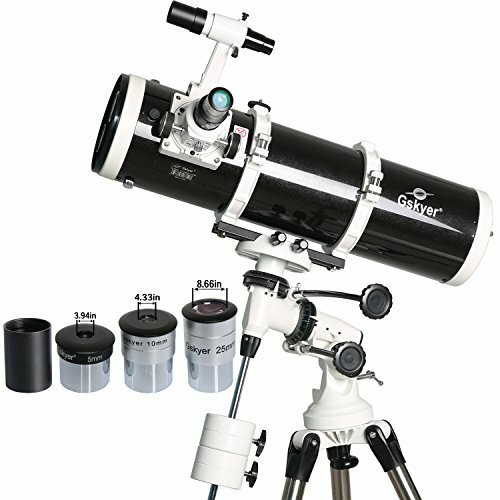 What You Get AZ90600 telescope with 3 eyepieces, our 12-month worry-free warranty and friendly customer service. ULTRA-CLEAR REFRACTING TELESCOPE: With 400 mm focal length and 70 mm aperture to capture more clear picture and optical glass coated for enhanced image brightness to protect your eyes. A awesome tool helps beginners and students to explore the space. OPTIMUM MAGNIFICATION: Two replaceable 1.25 Kellner eyepiece(K6mm/16X, K25/67X) to enhance the power for this astronomical telescope. 5X24 finderscope with mounting bracket and cross line, erect-image diagonal make locating objects more easily. EASY TO OPERATION: No tools are required for refractor telescope even for the novice. Adjusted from about 17.7-inch to 35.4-inch. Allowed for many different observational positions and keep the whole tripod steady with castor wheel. SHARING IN REAL TIME: You can take pictures or videos and share them with your family and friends in real time with the phone holder. Star telescope is suitable for kids who love science to discover the mystery of universe. RELAIBLE GUARANTEE- Come with a backpack and delicate box as a extra gift to your family. TELMU provides 24 month warranty to our customers. If you have any problem with this space telescope after you receive it, please contact us at first time. Ideal for the observer who views both astronomical and terrestrial objects, the Meade Infinity Series combines an altazimuth mount and quality optics for a superb value. For newcomers and beginners alike, these refracting telescopes are a great way for you to discover the cosmos and the outdoors. You ll discover more with the Meade Infinity Series. The Meade Infinity 50 Refractor telescope is a great telescope to introduce a younger audience to astronomy. This 50mm (2.0") aperture gives bright, sharp images for both land and celestial objects. Whether you're viewing the lunar craters, Jupiter, or terrestrial objects, the Infinity 50 Refractor allows the first-time observer to explore the world around them. Q: How is this telescope different than the other Infinity models (90, 80, 70, etc)? A: The differences between each model are aperture size. The bigger the aperture, the more light-gathering power the telescope will have, resulting in brighter, detailed images. The Infinity 50 has a 50mm aperture, a smaller aperture size than the other Infinity telescopes, but also has the lowest cost. How would you like to see the craters on the moon and planets of the solar system with great details? How about a clear, breathtaking view of the planet Jupiter? 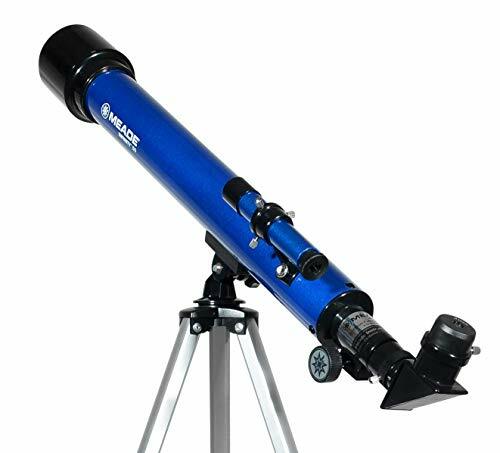 Aomekie Refractor Telescope is an amazing tool to magnify the sky, introduce and instill the love of astronomy to children early on! It increases the power of telescope to let us easier to focus moon and stars. For example, a telescope, which has a magnification of 50X, will have a magnification of 150X when a 3X Barlow lens is used. The 1.5X Erecting Eyepiece not only increases the magnification of telescope but also correct the direction of the image. For example, a telescope, which has a magnification of 60X, will have a magnification of 90X when a 1.5X Erecting Eyepiece is used. Since a telescope has a narrow field of view by design, it can be challenging to LOCATE A PARTICULAR STAR or PLANET. For this reason the telescope is fitted with a low-power, wide-field miniature telescope called a finder scope. Always start viewing with your 20mm eyepiece. This is your low power eyepiece and its wide viewing field will make it easier to locate objects. Once you have located an object and the view is clear you may wish to change to the high power eyepiece. 15-150X MAGNIFICATION: Two replaceable eyepiece(15X, 50X) in this astronomical telescope. 6mm eyepiece for 50X and 20mm eyepiece for 15X, 1.5X erecting eyepiece increase 1.5X magnification, 3X Barlow increase 3X magnification. 5X24 finderscope with mounting bracket, erect-image diagonal make locating objects more easily. Portable kids telescope - no tools are required for assembly, the telescope kit with lightweight and durable aluminum tripod goes together in minutes. FLUX is our most powerful and most advanced star projector available to date. Space travel has become obsolete since you can now simply bring 60,000 stars to your room by pushing a single button. Imagine watching the stars while sitting comfortably on the couch or lying in bed. With the Homestar Flux Planetarium, this dream becomes reality in its best possible way. Glass lenses project an amazingly accurate sky with 60,000 high-definition stars onto the ceiling or wall. Rotational movement is possible allowing you to observe the night sky as it is visible to us. With the "shooting star" function you can even dream beyond! Projection angle and focus are adjustable and a convenient timer is used to automatically turn it off. More than 30 optional star discs and all new scenic disc motives available for purchase. Telescope Specification - Aperture: 130mm (5.1 IN) - Focal Length: 650mm ( 26IN) - Focal Ratio: 5 - Eyepiece1: 25mm(0.98 IN) - Magnification1: 40X - Eyepiece2: 10mm(0.39 IN) - Magnification2: 100X - Eyepiece3: 5mm(0.2 IN) - Magnification3: 200X - Barlow lens: 3X - Finderscope: Red dot finder - Tube Connection: Anchor Ear - Tube Connection: Hook,Dovetail Plate - Mount: EQ Advanced Equatorial Mount - Optical Coating: Multi Antireflection Blue Film - Tripod: 1.25 inch Stainless Steel Tripod - Max Magnification: 307X - Minimum Magnification: 40X - Field of view: 1.5 - Main mirror length: 609.6mm (24IN) Remark 3 Inverted images eyepiece and a positive prism, switching between use About Refund Policy We support customers return goods if you don t like, But We suggest that if you have any problems please contact us first on amazon email directly,We have professional team and professional technical personnel to do the operation and guidance for you, I do hope you can support our work, and Love our products. About Feedback Your satisfaction and positive feedback is very important to us if you are satisfied with our items and services. If you have any problems with our items or services, please feel free to contact us first before you leave feedback. We will do our best to solve your any problems and provide you the best customer services. Product Description Gskyer Infinity have over 20 years Optical history,Use of Germany's advanced technology, for different groups of people from different telescopes for science, astronomy, exploration, and tourism, etc.Gskyer's value priced AstroMaster 130EQ is an affordable entry high level telescope with some nice extras like a correct image prism and "The Sky" astronomy. Reflector Telescope This 5.1 inch aperture reflector telescope gathers an ample amount of light for great views of the planets and Moon, as well as brighter galaxies, nebulas, and star clusters. High Quality Optics Short 24' long optical tube design and fast f/5 focal ratio. All-glass optical components with high transmission coatings for enhanced image brightness and clarity and stars. Widely Use 130mm telescope excels at daytime birding use as well as viewing wildlife, scenery and casual nighttime observing of the Moon. 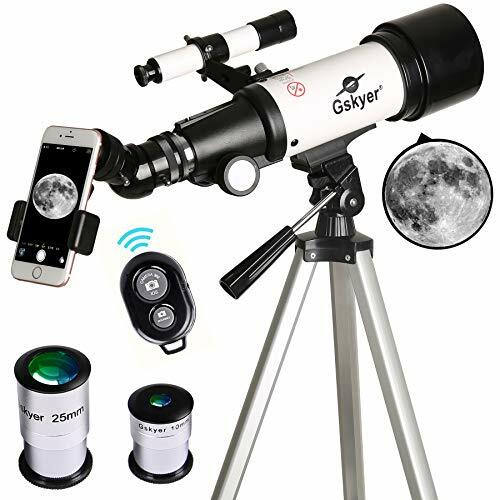 Complete Parts Come with 3 eyepiece, a 3X Barlow lens, a finderscope, an adjustable tripod and so on, contains the accessories you need it allows for any viewing position and on-the-go stargazing. Specification: Type: Refractor Aperture: 80mm (3. 15") Focal Length: 400mm (15. 75 ) Mount: AZ Altazimuth Mount Eyepiece: K25mm: 16X ; K10mm: 40X; K5mm: 80X Finderscope: 6*30 Zenith Mirrors: 48 Erecting BAK4 prism Tripod: stainless steel Tripod (adjustable) Barlow lens: 3XPackage Content: 1 x Telescope Optical Tube 1 x stainless steel Tripod 3 x Eyepiece ( 25mm & 10mm & 5mm ) 1 x 6*30 Finderscope 1 x Zenith Mirrors 1 x Barlow lens 3X 1 x TrayWarning! Warm Tips: If it shows a blurred picture, please adjust focus using focus wheel. When observing an outdoor target with an astronomical telescope indoors, do not close the window to avoid the deformation of the image caused by the reflection of the window glass. Use a telescope outdoors, please wait for the temperature of the product is the same as the outdoor temperature, the performance will be better. Avoid accidentally taking the telescope into a larger temperature difference environment because the moisture in the air will condense on the objective. NEVER aim your telescope at the sun or even close to the sun! 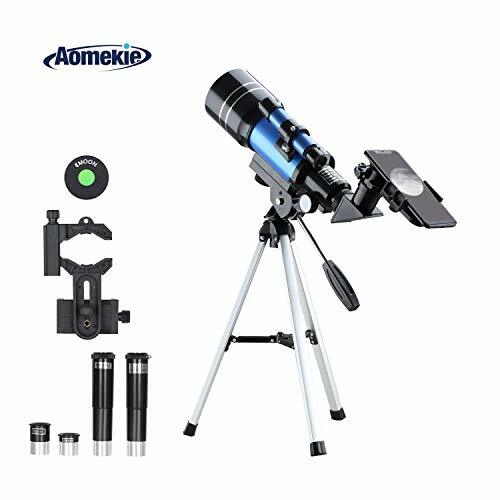 Ultra-clear Refracting Telescope With 400 mm focal length and 80 mm aperture to capture more light picture and optical glass coated for enhanced image brightness to protect your eyes. Optimum Magnification Three replaceable eyepiece (16X, 40X, 80X) with a 3X Barlow lens. 6*30 finderscope with mounting bracket, erect-image diagonal make locating objects more easily. Adjustable Tripod This telescope allows for many different viewing positions with a adjustable tripod. Adjustable full size tripod ensures a stable platform. 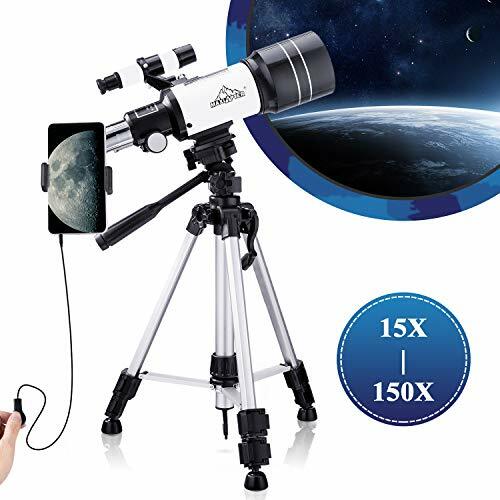 Applicable Use This telescope is quick and easy to set up even for the novice and will encourage kids to love learning about space, great gift idea for kids who love science and astronomy! The popularity of our NexStar 114 models inspired us to go bigger! We are proud to introduce NexStar 130SLT. The NexStar 130SLT has 30% more light-gathering power than our 114 mm telescope. And the 130SLT, like the other models in the SLT Series, comes with a fully computerized hand control. The computerized hand control gives you the ability to automatically slew to any of its 4,000+ objects, including over 600 galaxies, 300 clusters and dozens of beautiful binary stars. With its pre-assembled, adjustable steel tripod, the NexStar 130SLT can be up and ready to use in a matter of minutes. Our new SkyAlign alignment technology and the included StarPointer Finderscope with a red LED, makes aligning a breeze. View the details of the lunar surface, the rings of Saturn, the polar ice caps on Mars, the cloud belts on Jupiter or a number of the Messier objects such as the globular cluster in Hercules (M13), or the Great Nebula in Orion (M42). Begin to explore some of the fainter Messier objects using the additional light-gathering capabilities of the 130SLT s 5" primary mirror. Because of the Newtonian design, the mirror gives fully color-corrected views that are best suited for astronomical use. * MaxUSee 70mm Refractor Telescope + 8X21 Compact Binoculars - The wonderful gift to kids for Nature Exploration! 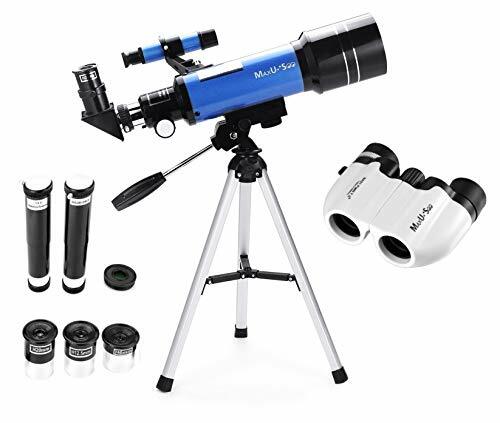 - The 70mm Telescope comes with 3 interchangeable eyepieces as well as 3X Barlow lens & 1.5X Erecting eyepiece which you can enjoy different magnifications from 20X to 200X, suitable for Kids and Astronomy Beginners. - The 8X21 Binoculars is with BK7 Roof prism & FMC Green Multi-coated Optics offer clear image, perfect for Bird watching, Sightseeing, Camping, Wildlife watching, Sports & Concert events, etc. NEVER aim your Telescope and Binoculars at the sun or even close to the sun! Portable telescope with magnification 20X to 200X -- the perfect First Telescope for Kids & Astronomy Beginners. With 8X21 Compact Binoculars -- the wonderful gift for kids to explore nature! Includes 3pcs 1.25 eyepieces H6mm, H12.5mm and H20mm. High magnification (H6mm), middle magnification (H12.5mm) and low magnification but with sharper image (H20mm) eyepieces give you variety for any viewing situation. 8X21 Compact Binoculars with FCM green multi-coated optics ideal for Travel, Bird watching, Sightseeing, Camping, Wildlife watching, Sports & Concert events, etc. Here is a fun and compact telescope that's sure to inspire the whole family's natural inclination to explore. The Orion StarBlast 4.5 Astro Reflector Telescope is no toy - it's a real reflecting telescope that is wonderfully simple to set up and use! A perfect telescope for beginning amateur astronomers, the StarBlast 4.5 Astro Reflector is manufactured with the kind of quality you'd expect only to find in much more expensive models. Everyone in the family will enjoy using the StarBlast 4.5 Astro Reflector telescope thanks to its uncomplicated, simple design and high level of performance. 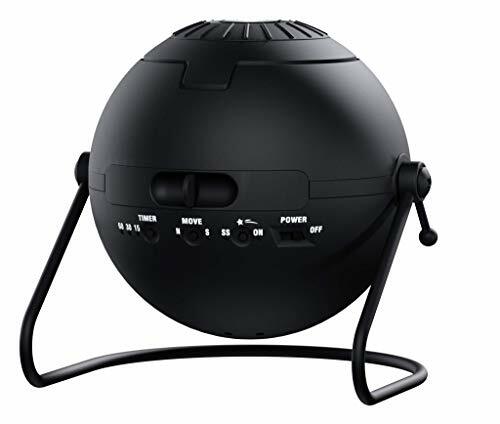 The StarBlast 4.5 will give beginning amateur astronomers hour after hour of fun under the stars and also nurture their interest in the night sky, thanks to its exceptional, high-quality optics. 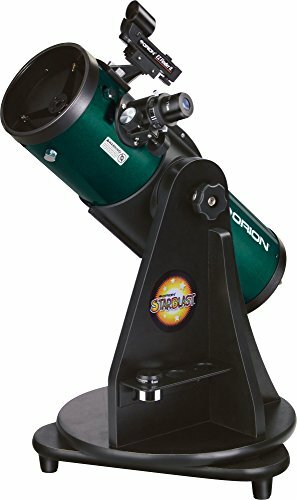 In fact, the optics of the StarBlast 4.5 Astro Reflector are so good that it's also a very popular choice for more experienced amateur astronomers looking for a compact and portable telescope to use as a grab-and-go alternative to larger, bulkier mounted models that require more setup time and maintenance. With its 4.5 inch aperture parabolic primary mirror, the StarBlast 4.5 Astro Reflector Telescope will wow the whole family with gorgeous wide-field views of the night sky. Fascinating craters and mountains on the Moon pop out in crisp detail through the pint-sized StarBlast 4.5 Astro Telescope, but the fun doesn't end there. You'll see more than just the Moon with this capable reflector. On clear evenings, the StarBlast 4.5 can provide pleasing views of giant Jupiter with its orbiting moons and Saturn with its stunning rings. Thanks to its precisely crafted, wide-field f/4 reflective optics and significant 4.5 inch (114mm) aperture, the StarBlast 4.5 Astro Telescope can reveal intriguing views of bright galaxies, distant cloudy nebulas, and sparkling star clusters for the whole family to enjoy. 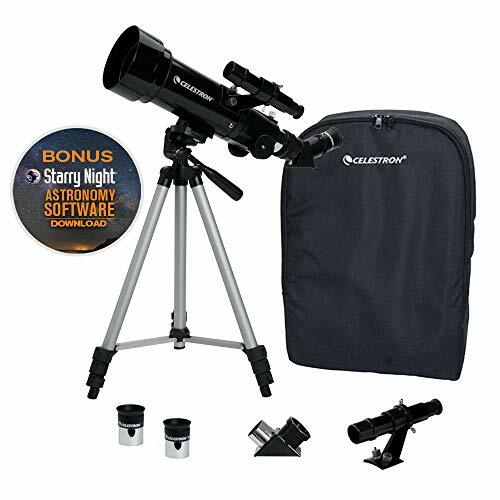 Includes two Explorer II 1.25 inch Kellner telescope eyepieces (17mm and 6mm), EZ Finder II reflex sight for easy aiming, eyepiece rack, collimation cap, Starry Night astronomy software, and more! 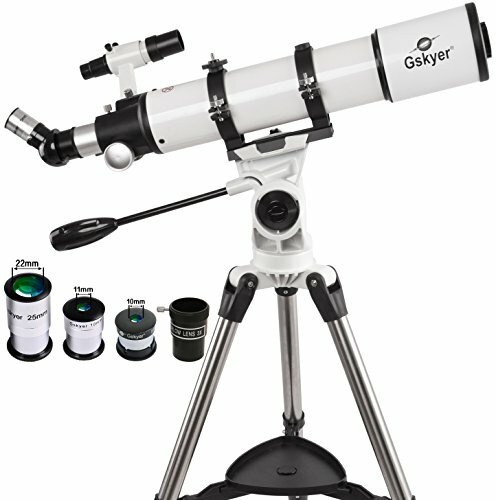 Universal telescope with bright image quality and high magnification. 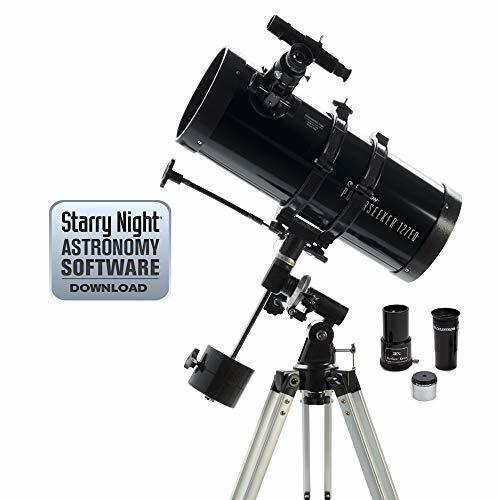 Ideal for beginners to explore vast sky like moons, planets, clusters and fog. At the same time, you can enjoy endless scenery, mountains, rivers, flowers, birds and animals. Stay away from computer games.  Basic - 70MM aperture gathers more lights for good performance observation of celestial,suitable for kids and beginner.  High Magnification - Comes with 6mm eyepiece,20mm eyepiece,1.5x and 3x Barlow lenses and finder scope, 300mm focal length, 70mm aperture, perfect for sky viewing,bird watching,safari,camping.  Clear & Real - Powerful full multi-coated optical lens for clear and sharp images of the moon even craters. 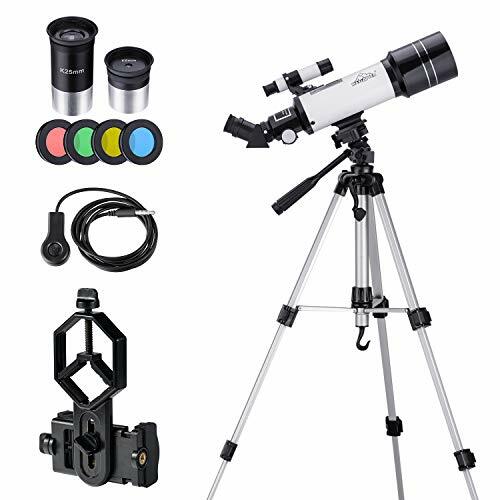  Portable & Durable - No tools are required for assembling, the telescope kit with lightweight and durable aluminum tripod goes together in minutes that can be used.  WORDWIDE WARRANTY - Global after-sales service and high-quality products. If there is any dissatisfaction, there will be a 100% refund, guaranteed. This is your high-quality choice, and we look forward to your experience! MAXLAPTER starter astronomy telescope is a dual-use telescope for day and night to look at the nature on the land or in the sky. 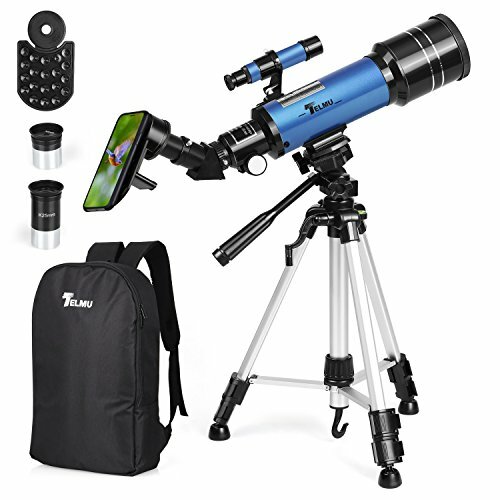 It provides a professional start for starters and children to learn about the nature and universe with clear and sharp images, fulfilling the functions via phone adapter mounting, wired shutter control, multi-language manual, and other helpful accessories . Main Tube-- Finder scope -- Zenith Mirror -- K25mm Eyepiece-- Extend the Tripod -- Extend the tripod and connect the main tube. 2) For FOCUSING , try and find the Moon through Finder Scope(you may just find a bright spot light here), then align it with the objective lens, and observe it from K25mm Eyepiece for clearer image. Don't forget to lock the position right now. If you fail to find the Moon, please try it at daytime with an object easier to find. 3) For DIRECTION ADJUSTMENT , check every locking of the tripod on different direction before and after the adjustment. 4) For MOON FILTER , take out the eyepiece, and rotate the filter between the zenith mirror and eyepiece through spiral, and then set the eyepiece back to normal. 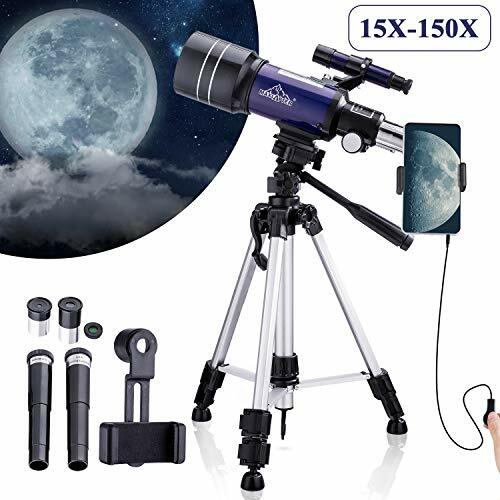 5) For PHONE ADAPTER , after the telescope is focused and tripod is fixed, connect the phone adapter onto eyepiece, turn on your phone camera to align with the eyepiece(you can see the view on phone screen), and then fix the phone onto adapter. 6) For K6mm EYEPIECE , after you get a clear image from K25mm, you may switch to K6mm eyepiece for 66x magnification. The image will be dimmer under such magnification, and any movement may cause shaking and blurring. Don't use the telescope to observe the sun directly in case of permanent harm on eyes. MOON FINDER K25mm for 16x magnification; K6mm for 66x, easy to find the Moon and observe the Crater in details. 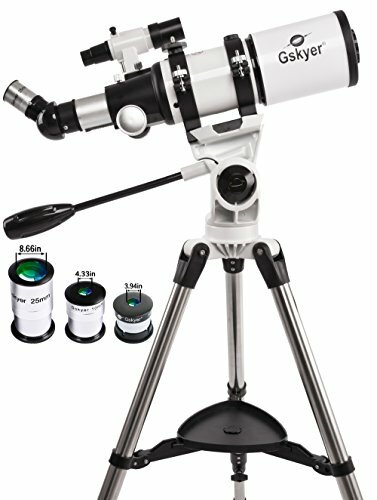 This telescope works well for kids and beginners with simple assembly and fast focus. Professional STARTER TELESCOPE Equipped with blue-coating 70mm objective lens, it enhances the light transmittance and image quality. It offers positive image with 45 zenith mirror, same as the view from eyesight; so you may use it at day time for birdwatching or nature. Bonus - STANDARD TRIPOD Accompanied with 43 inch standard tripod (for telescope or camera), phone adapter mounting, wired shutter control, moon filters, hope it will bring more fun to you and your family. Portable TRAVEL SCOPE Its light-weight material and design make it easy to take out in backpack for camping or travelling; while the loading hook on tripod can enhance the stability by hanging extra items. Worldwide Warranty 100% MONEY BACK GUARANTEE: You are protected by a lifetime, no-question asked, money back guarantee along with world class customer service! WR860 is a high-definition monocular telescope for adults and kids, suitable for outdoor and indoor use, such as birdwatching, hiking, watching performance and sport games. It can brings the nature closer to you. 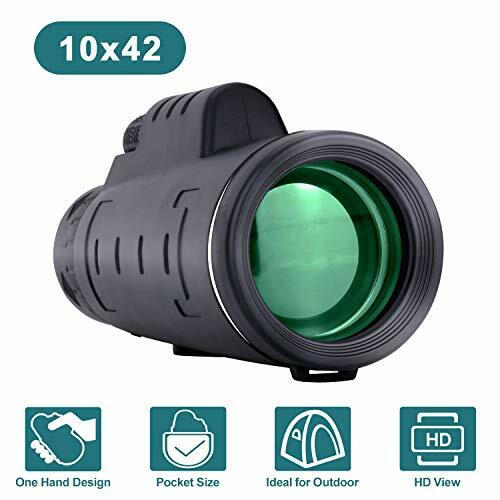 HD High power monocular: It has stable 10x magnification, ideal for single handy operation for birdwatching, travelling, outdoor sports watching. 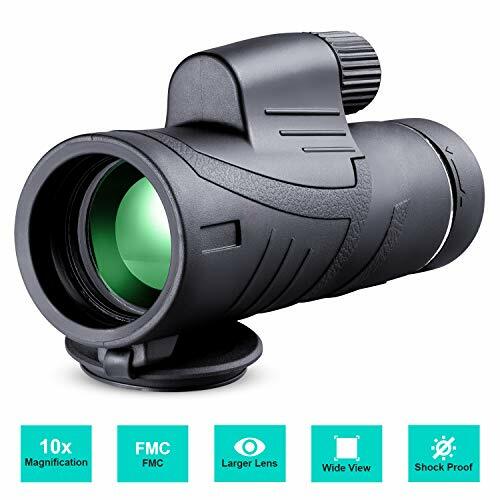 Professional elementary level optics: Fully multi-layer coating with green film enhances light transmittance for brighter and sharper image, while its reasonable price would be a wise choice as a first monocular for beginners, kids, and adults. Portable pocket size: 280g is lighter than a bottle of water, so that you can take it everywhere you want even just keep it in your pocket. Anti-skidding design: Equipped with hand strap and anti-slip main tube, it reduces the chances of lose at outdoors. Eco-friendly rubber frame: Used environmental friendly rubber material, it is durable and longlasting product without deforming. Do not look directly at the sun through a telescope, otherwise it will hurt your eyes. Please put it in a dry place if it is long term unused. High Definition Multi-layer green optical coating ensures HD clear and sharp image. This high power monocular brings world closer to you and allows you to seize every moment of nature. Wide Field of View Equipped with 18mm eyepiece and 42mm objective lens, it has a wider field of view 366ft at 1000 yards. You may rotate the focusing wheel until getting a clear and comfortable view. Compact Size This handy telescope weighs only 230g for single-hand control, with compact size for pocket, easy to take out anywhere with you, applied in birdwatching, hiking, scenery, enjoy performance and sport games. Shock Absorbing Frame This corrugated eco-friendly rubber material offers shock absorbing frame, well-tested and examined with anti-skidding design, and enhance the protection for inner professional optical elements. Worldwide Warranty 100% REFUND GUARANTEE: You are protected by a lifetime refund guarantee with first class customer service! If there is any questions, please do not hesitate to contact us. We will reply you within 24 hours. 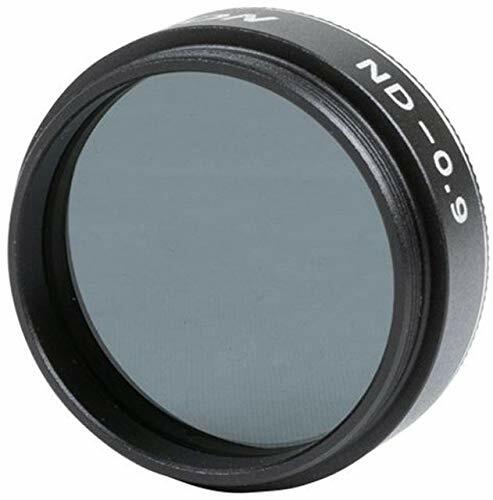 Celestron 94105 Neutral Density Moon Filter 1.25"
Neutral Density Moon filter 1.25"
Keep the world in your hand - Wide field of view makes it easier to locate and track distant objects while providing you with bright and high resolution images. Perfect for sightseeing, sports games, hiking, climbing, camping, bird watching and other outdoor or leisure activities. High Definition & Quality - This monocular sports a BAK-4 Roof Prism and FMC Fully Multi-Coated Lens, which increases the light transmission with multiple anti-reflective coatings on all air-to-glass surfaces, the light transmittance reaches to 97.85%. The use of low-speed polishing technology makes better optical effect. Wide Bright & Clear View - 10x magnification and 42mm objective diameter wide lens can gain Larger and Brighter range of view from a distance of about 1000 yards. Let you have the best view in outdoor adventures. Portable & Easy - With a dimension of 6.3 x 2.4 x 3 inches, you can easily slip it into your pants or shirt pocket. For its small volume and lightweight, you will never feel fatigued from carrying this device. Perfect for Moon watching, Bird watching, Hiking, Climbing, Watching Wildlife and Scenery, Concerts and Travelling etc. Waterproof & Durable - This monocular with a rubber armor body is durable,waterproof and environmental protection.It also will give you a comfortable hand feeling.Moreover,the objective lens and eyepiece are equipped with dust cover to protect the lenses. Comfortable & Reasonable - The eye relief is extremely comfortable, as it features adjustable eyecups, which makes it ideal to be used with glasses or not. And it comes with the feature of mounting a tripod which can be used to free up your hand, when you feel fatigued or want to fix the monocular.